Kudos Inspire 4 Panel Compact Bath ScreenFrom £304.16 inc.VATRRP: £434.52 (Save 30%)4 Panel 1500 x 950mm Shower Screen with 6mm toughened glass. Kudos Inspire 2 Panel In-Swing Bath ScreenFrom £227.38 inc.VATRRP: £324.83 (Save 30%)1500(h) x 950(w)mm with bracing bar. 305mm fixed panel and 645mm inward folding panel. KUDOS shower screens have been designed with your bathroom needs in mind. With the perfect blend of being fully flexible and high quality, they offer a genuine alternative to more traditional shower screens. Available in a range of designs, they will not only give your bathroom a clean and elegant look, but they’ll also give you added safety and reliability. KUDOS shower screens come in either 6mm or 8mm safety glass that has been fitted with Lifeshield Glass Protection. 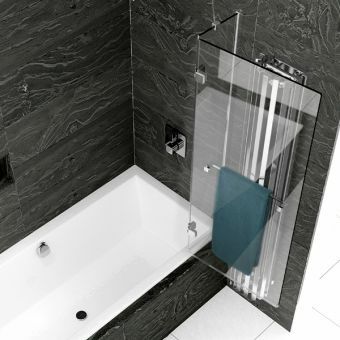 Sleek, durable and practical, a KUDOS shower screen is a great option if you’re looking to invest in a shower screen. Thanks to the fact KUDOS employ some of the latest design technology in their shower screens, you won’t be compromising on anything no-matter what shower screen you choose to install. 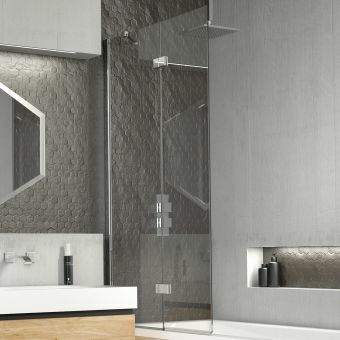 All of their shower screens have been made with making your shower or bath experience as good as possible, so if you’re after a shower screen that not only looks great, but operates well too, then KUDOS could be the choice for you. With a range of options available to you that includes single, two, three and four-panel systems, you can strike the perfect balance between showers and baths. If you like to take lots of baths, then a three or four-panel system could work for you as it gives you an unobstructed, open feel when the screens are closed whilst giving you all the protection you need when it comes to taking a shower. If, on the other hand, you prefer showers, a single or two-panel system gives you easy access to the bath without compromising on water protection. With an emphasis on minimalist design, KUDOS shower screens have been crafted to give your bathroom a clean and unobtrusive look. It means that they can effortlessly slot into a wide range of styles without taking the focus away from your overall aesthetic, and with the cutting edge build quality that comes with every screen, you can be confident that you’re getting a product that’s going to last an entire lifetime. So no-matter what bathroom you have, whether it’s big or small, traditional or modern, you’re sure to find a KUDOS shower screen that can suit both your budget and your bathroom. The simplest of all the KUDOS designs, the single panel shower screens are a great way to give your bathroom a sleek look whilst ensuring that entering and exiting the bath is always as safe as possible. 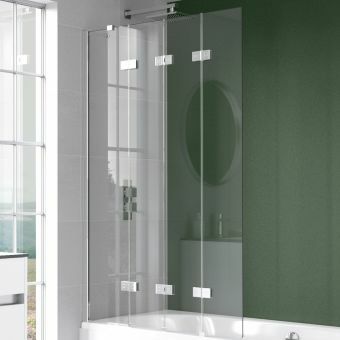 Easy to install, the single panel shower screens come in both fixed and sliding fittings that use 6-8mm safety glass. In order to ensure that you get the added benefit of having a more spacious shower area, the KUDOS single panel shower screens are oversized when compared to standard panels. Measuring at 1500 x 850mm, they’ll allow you to make the most of your space, ensuring you don’t feel cramped or closed in. Every single panel KUDOS shower screen can also be fitted with an optional integrated towel rail, which not only adds convenience, but is also a great safety feature as it saves you from having to stretch for your towel. The KUDOS two panel systems come with both in-fold and out-swing designs, allowing you to truly have your bathroom, your way. With their oversized doors that are available in sizes up to 650mm wide, they are ideal for both small and large baths and add a touch of unobtrusive, elegant design to your bathroom. Designed with ease of use in mind, the KUDOS two panel systems have high quality, durable click-to-lock hinges. That means you can hold the door in position during use, which makes access and cleaning especially easy. Ultimately, the two-panel system is about giving you the safety and durability you need from a shower screen. That’s why the section of the door nearest the shower is always permanently fixed to the bath. Whether you opt for an in-fold or out-fold design, that section always remains firmly in place, giving you water protection where you need it most. By fitting a KUDOS 3 panel system, you are giving yourself the ultimate in bath over shower protection. Expertly designed to be as safe and secure as possible whilst giving you water protection, a three-panel in-fold system also makes a design statement that’s sure to complement your bathroom’s aesthetic. Suitable for a range of bath sizes, the three-panel system has a special curved bottom edge which has been crafted to give your bath extra definition. By being extendable to 1250mm, you can be sure that you’re going to get great water protection, making the floor safe and dry when you step out of the bath. The three-panel system is easily accessible too; by folding in to just 500mm, you can step in and out of the bath with ease as-well as carry out any cleaning. Installing a KUDOS three-panel system means that you’re getting the best of both worlds: not only do you have the added benefit of an open bath when the screen is closed, but you’re also getting an oversized shower area when the screen is open. So if you enjoy baths as-well as showers and don’t want to feel too closed in when you’re having a bath, the KUDOS three-panel in-fold screen could well be for you. Don’t forget that also it comes in both left-hand and right-hand fits, which makes installation as easy as possible. If you’re truly after the best of both worlds, then the KUDOS 4 panel system could well be for you. 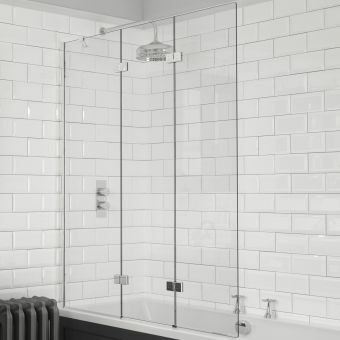 For those who don’t wish to compromise when it comes to having a bath or shower, the 4 panel system not only gives you complete and full access to your bath, but when you’re having a shower, you can rest assured that your bathroom is going to be protected from any potential water damage. Aside from the huge accessibility benefits, the four-panel system will give your bathroom a clean and clutter free look and instantly improve the overall feel of your bathroom. Extending to 950mm when fully open, the KUDOS four-panel screen hooks to the edge of the bathtub and creates a seal. This creates an extra safe environment simply by preventing any leaks. So, if you’ve having a shower, you can be sure that the surrounding areas will remain free from any potential dripping water hazards. When it comes to having a bath, stepping in and out of the shower or cleaning, the four-panels reduce to just 300mm when fully closed. So if you want to enjoy a bath without feeling closed in, you can still enjoy the feel of an open bath with the four-panel system. One of the most common issues people experience is that they don’t have unobstructed access to their bath, the four-panel system solves that with its intuitive and clutter free design. By having each of the 215mm wide folding panels sit neatly behind the 300mm fixed screen when you’re not having a shower, you can be sure that access to the bath will never be a problem. 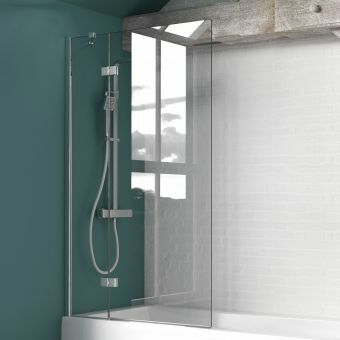 The L-shaped screen made to fit modern design shower baths is a universal fit and provides a tight seal between the bath and glass to ensure spray is kept within the showering area. At 809mm deep and 1500mm high, its tough 5mm glass is made to last and carries the same lifetime guarantee as all of KODOS's products. Ultimately, it is protected with the Lifeshiefd glass coating so up-keep is minimal. We want to make sure that you get the right solution for your bathroom and your budget. The convenience and safety that come with a KUDOS shower screen will allow you to enjoy showers or baths with the knowledge that your bathroom is going to stay protected from any potential water damage, as-well as the fact that you’ll be fully safe. KUDOS take pride in using the very latest in design technology. Not only are they made from high-quality material, their shower screens are really easy to clean, which means that you won’t have to worry about maintaining their appearance. In fact, thanks to the Lifeshield Glass Protection, cleaning has never been easier. Whereas some shower screens may allow water droplets to stay on the screen, KUDOS know that water droplets contain dirt, that’s why the screens they produce ensure that droplets slip down the glass into your tray, so you can spend less time worrying about cleaning, and more time enjoying your bathroom. Made in the UK, KUDOS have made sure that they hand build every single one of their shower screens within the British Isles. With quality their number one priority, KUDOS have made sure that by having everything in the UK, they can cut down on transport costs. Put simply, that means that they can spend more time ensuring that their screens look great and offer high-quality to the customer. They’re reliable too, with a KUDOS shower screen; you get click-to-lock hinges, which add a great deal of strength and durability. With KUDOS, it’s all about the quality so you don’t have to worry about any potential damage or replacements. In fact, KUDOS are so confident in the shower screens they produce, that no-matter which design you choose, you’ll get a lifetime guarantee as standard. 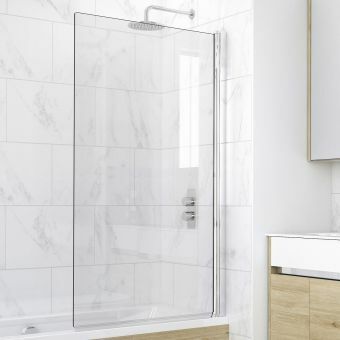 Remember, all of the shower screens featured here come with the option of adding an optional towel rail, so if you’re looking for added convenience and safety, that could be an option that’s well worth considering. Ultimately, it’s your bathroom and you’re going to want to make sure that you get your decision just right and sometimes that decision isn’t always the easiest. That’s why here at UK Bathrooms, we have a specialist team of bathroom experts that are waiting to assist you with any questions you may have. If you need any assistance whatsoever, please do not hesitate to give your team a call on 01765 694 720.